A great deal could be said in response to the various points Fesko raises in his essay, but I’ll restrict myself to some remarks on his core argument and a few other related matters. Fesko’s main target is the “Vosian Van Til thesis” which maintains that “Van Til and Vos had the same view of epistemology,” that there’s a “symbiotic relationship between Vos and Van Til,” and that “Van Til learned a unique epistemology from Vos.” Fesko readily concedes that Van Til was significantly influenced by Vos, but he wants to challenge the stronger claim that Van Til adopted a distinctive epistemology from Vos which served as a kind of course-correction for Reformed philosophy and apologetics. Vos (and the historic Reformed tradition) affirmed both natural theology and the traditional scholastic distinction between ‘pure’ and ‘mixed’ articles of faith. Van Til rejected both of the above. Therefore (contra the Vosian Van Til thesis) there’s significant discontinuity between Vos and Van Til. Vos stands in line with the historic Reformed tradition; Van Til does not. Vos approved of Bavinck’s “moderate realism”. Van Til criticized Bavinck’s “moderate realism”. Therefore, Van Til’s epistemology isn’t in line with Vos’s. 2. Along the same lines, we should acknowledge that the article is an exercise in historical theology: it concerns the intellectual relationship between two Reformed thinkers (and also their relationship to earlier Reformed theologians). Historical claims do not establish philosophical or theological theses. Fesko’s argument tells us little if anything about whether Vos’s position, Van Til’s position, or some other position is the right position to hold. The mere fact that Theologian A’s position aligns with Theologian B’s position, or stands in continuity with Tradition C, doesn’t as such give us any reason to agree with A, B, or C.
3. Some readers will take (and have taken) the article to provide support for Reformed scholasticism or Reformed Thomism. But again, I think that misses the scope of the argument. Nothing in the article constitutes a defense of scholasticism or Thomism as such. For example, there’s nothing here that vindicates the use of Aristotelian metaphysics or Aquinas’s nature-grace scheme. 4. The article refers to “Van Tillians” as though that’s a homogeneous group partly defined by a commitment to the Vosian Van Til thesis. But there have been considerable disagreements among self-described Van Tilians about how to interpret Van Til’s claims and implement his apologetic program. Van Tilians are no more a homogeneous group than Thomists. Fesko takes the claims of William Dennison and Lane Tipton to be representative of all Van Tilians. But on what grounds? Why think they speak for everyone who endorses a Van Tilian approach to apologetics (especially with respect to historical theses about lines of intellectual influence)? Some time ago I plugged Guillaume Bignon’s Excusing Sinners and Blaming God. Kevin Timpe wrote a critical review of the book in the journal Faith and Philosophy, and Bignon has now posted a response to the review on his website. His response is useful because it not only rebuts Timpe’s criticisms, but also takes the discussion further in some respects. Check it out. The First Commandment demands that we worship no other gods besides the Lord God (Exod. 20:3; Deut. 6:13; Matt. 4:10). Jesus is (rightly) worshiped by his disciples (Matt. 14:33; 28:9; 28:17; Luke 24:52; Rev. 5:11-14). Therefore, the worship of Jesus must be the worship of the Lord God. Since it’s very difficult to reject premise 2 while accepting the authority of the New Testament, some unitarians (those who deny the deity of Christ) concede the point but counter that worshiping Jesus doesn’t violate the First Commandment even though Jesus is a mere creature. They suggest that the commandment needs to be understood in the context of Ancient Near Eastern polytheism. What the commandment forbids is the worship of other gods in addition to the Lord God (specifically pagan gods such as Baal, Molech, etc.). The worship of Jesus doesn’t involve any such thing (so it is argued) because the one true God is being worshiped through Jesus, by God’s own designation. Jesus is God’s unique agent and mediator of salvation, and therefore the worship due to God for his works of salvation can be appropriately mediated by Jesus. In short, to worship Jesus is to worship God indirectly rather than directly. Jesus is the proper medium for the worship of God. But that doesn’t require us to say that Jesus is equal to God. 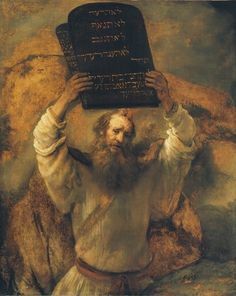 One difficulty with this response is that it neglects the close connection between the First and the Second Commandment. Both commandments are concerned with the proper worship of God, but in different respects. The First Commandment says, in effect, that we must worship the true God only: no worship of false gods. The Second Commandment says, in effect, that we must worship the true God truly: no false worship of the true God. The paradigmatic case of the latter sin is worshiping God through creaturely images (cf. Deut. 4:15-17). 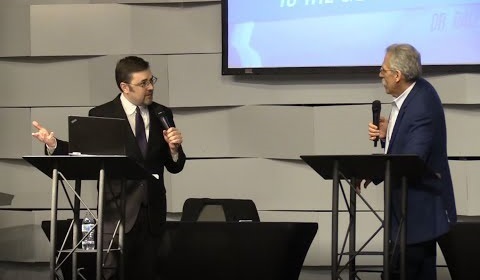 Last week Dr. Dale Tuggy debated Dr. Michael Brown on the question, “Is the God of the Bible the Father alone?” (Tuggy affirmed; Brown denied.) The entire debate, including Q&A, can be viewed here. A print version of Tuggy’s opening statement can be found here. Brown’s opening statement can be read here. I thought it was a very useful, high-quality debate between two smart, serious people who stuck to the arguments and treated each other with respect. Tuggy and Brown are quite different in their skill sets, theological methodologies, and speaking styles, which made for an interesting match-up. Is the God of the Bible the Father alone? Tuggy’s task was to argue that the God of the Bible is the Father alone. Brown’s task was to argue that the God of the Bible isn’t the Father alone. To win the debate, Brown didn’t have to defend trinitarianism or any particular theory of the Trinity. He only had to show that the God of the Bible is identified with someone other than the Father, such as the Son or the Spirit. In fact, Brown targeted nearly all of his ammunition on showing that the Bible identifies the Son with Yahweh and attributes to the Son things that imply his equality with the Father as to deity (the Son is eternal, creator of all things, shares the glory of the Father, receives the same worship as the Father, etc.). You can review Brown’s opening statement to confirm that this was his main emphasis. Strange as it may sound, given the specific proposition being debated, Brown could have adopted a modalist position and still won the argument! (Interestingly, Tuggy suggested a few times that Brown was in fact expressing a form of modalism, albeit unwittingly. Even if Tuggy were right about that, it would have been beside the point in the context of the debate.) Brown’s task wasn’t to defend the specific claim that there is one God who exists in three distinct persons, still less to defend some metaphysical model for that claim. Indeed, he expressed reservations about adopting creedal language (“persons”) rather than biblical language. I don’t share those reservations, but again, that’s beside the point here. All Brown had to do was argue that the Bible teaches the full deity of Christ, i.e., that the Son is divine in the same sense that the Father is divine. In my judgment Brown did argue that persuasively, and Tuggy’s alternative interpretations of the key texts seemed stretched (e.g., Heb. 1:10-12 and Col. 1:15-17 are really speaking about the new creation; the logos in John’s prologue is something like God’s eternal wisdom rather than the preexistent Son who became flesh). For that reason, even while admitting my own biases, I’d say Brown won this round. Posted on 9 January 2019 | Comments Off on Determined to Believe? John Lennox is Emeritus Professor of Mathematics at the University of Oxford and an evangelical Christian with a longstanding concern to defend the Christian faith in the public sphere. In recent years he has risen to prominence as an articulate, well-informed, and winsome apologist, writing books on the relationship between Christianity and science, and engaging in public debates with prominent skeptics such as Richard Dawkins, Christopher Hitchens, and Michael Ruse. His 2007 book God’s Undertaker, which I have often recommended to my students, deftly debunks the myth of conflict between religion and science. I wish I could be so enthusiastic about his recent foray into systematic and philosophical theology, which might well have been titled Calvinism’s Undertaker. 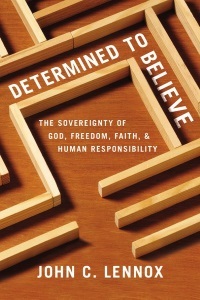 As Lennox explains, his latest book “is written mainly for Christians who are interested in or even troubled by questions about God’s sovereignty and human freedom and responsibility” (15). Having been asked on many occasions to share his views on this thorny issue, Lennox decided to embark upon a book-length treatment of the topic. The primary target of his book is theistic determinism, which Lennox nowhere explicitly defines but apparently takes to be the view that God determines—more specifically, causally determines—every event in the creation, including the decisions and actions of his creatures. The book consists of 20 chapters and is divided into five parts. In this review I will summarize the content of each part, offering some critical comments along the way, before concluding with some concerns prompted by the book’s title. Comments Off on Determined to Believe? Posted on 21 December 2018 | Comments Off on Is Calvinism Unliveable? It’s sometimes claimed that determinism is irrational because (so the argument goes) one can’t consistently believe that one’s beliefs are determined. Occasionally this is transposed into an objection to Calvinism, since Calvinism is arguably committed to theistic determinism. As a former agnostic, one of the most powerful apologetic arguments against naturalism, atheism (and so on) is the idea that nobody strives to be a *consistent* naturalist/atheist/etc. In other words, they fail to act in accordance with the nihilism to which many of these ideas logically lead. Being more than a little curious, I stumbled into the free will position within Calvinism. Doesn’t this lead to a similar problem? In other words, what exactly does a consistent Calvinist even look like? I think that you’ve successfully identified a problem with determinism in general, Leif, of which Calvinism is but a specific instance, given the Calvinist’s view that God determines everything that happens. Note first that Craig treats Calvinism as merely one species of the genus determinism, taking it that any problem with determinism in general must afflict Calvinism’s theistic determinism. I doubt things are that simple. It’s pretty difficult to generate an argument against determinism as such, which is why most anti-determinist arguments target particular types of determinism (e.g., physical determinism or nomological determinism). Comments Off on Is Calvinism Unliveable? Beware of the argument “the church gave the Bible (and therefore the Bible can never give us ground for criticizing the church).” It is perfectly possible to accept B on the authority of A and yet regard B as a higher authority than A. It happens when I recommend a book to a pupil. I first sent him to the book, but, having gone to it, he knows (for I’ve told him) that the author knows more about the subject than I. Source: The Collected Letters of C.S. Lewis, vol. 3, ed. Walter Hopper (HarperCollins, 2007), pp. 1307-8. 4. The authority of the Holy Scripture, for which it ought to be believed, and obeyed, dependeth not upon the testimony of any man, or church; but wholly upon God (who is truth itself) the author thereof: and therefore it is to be received, because it is the Word of God. 10. The supreme judge by which all controversies of religion are to be determined, and all decrees of councils, opinions of ancient writers, doctrines of men, and private spirits, are to be examined, and in whose sentence we are to rest, can be no other but the Holy Spirit speaking in the Scripture. In sum, the testimony of the church counts for something; it serves as a lesser (fallible) authority pointing us to a greater (infallible) authority. And since the second is a higher authority, it can stand in judgment over the first, correcting it where necessary. There’s nothing incoherent about that position, as Lewis’s helpful analogy illustrates. Bonus points if you catch the numerical lapsus linguae in the first section! “Great Doctrines of the Reformed Faith” is the title of the 2018 Thornwell Lectures hosted by First Presbyterian Church in Columbia, SC. I was honored to be invited to contribute to this year’s lecture series and I spoke on the topic of Scripture’s Self-Attestation. The entire series is available on sermonaudio.com. Previous speakers include my RTS colleagues Ligon Duncan, Guy Waters, and Kevin DeYoung. Lectures from earlier years, going back to 2012, are also available. Pragmatism is the view that a belief or claim is ‘true’ not because it accurately represents the way things are, but because it has beneficial effects. Truth is what’s useful, what works, what gets results. Correspondingly, religious pragmatism is the view that religious beliefs should be deemed ‘true’ if and only if they have good effects. Obviously this is quite a departure from the commonsense view of religious beliefs and religious truth, according to which the statement “God exists” is true if and only if, as a matter of fact, God exists. I find great intellectual difficulties in this doctrine. It assumes that a belief is “true” when its effects are good. If this definition is to be useful—and if not it is condemned by the pragmatist’s test—we must know (a) what is good, (b) what are the effects of this or that belief, and we must know these things before we can know that anything is “true,” since it is only after we have decided that the effects of a belief are good that we have a right to call it “true.” The result is an incredible complication. Suppose you want to know whether Columbus crossed the Atlantic in 1492. You must not, as other people do, look it up in a book. You must first inquire what are the effects of this belief, and how they differ from the effects of believing that he sailed in 1491 or 1493. This is difficult enough, but it is still more difficult to weigh the effects from an ethical point of view. You may say that obviously 1492 has the best effects, since it gives you higher grades in examinations. But your competitors, who would surpass you if you said 1491 or 1493, may consider your success instead of theirs ethically regrettable. Apart from examinations, I cannot think of any practical effects of the belief except in the case of a historian. But this is not the end of the trouble. You must hold that your estimate of the consequences of a belief, both ethical and factual, is true, for if it is false your argument for the truth of your belief is mistaken. But to say that your belief as to consequences is true is, according to James, to say that it has good consequences, and this in turn is only true if it has good consequences, and so on ad infinitum. Obviously this won’t do. There is another difficulty. Suppose I say there was such a person as Columbus, every one will agree that what I say is true. But why is it true? Because of a certain man of flesh and blood who lived 450 years ago—in short, because of the causes of my belief, not because of its effects. With James’s definition, it might happen that “A exists” is true although in fact A does not exist. I have always found that the hypothesis of Santa Claus “works satisfactorily in the widest sense of the word”; therefore “Santa Claus exists” is true, although Santa Claus does not exist. James says (I repeat): “If the hypothesis of God works satisfactorily in the widest sense of the word, it is true.” This simply omits as unimportant the question whether God really is in His heaven; if He is a useful hypothesis, that is enough. God the Architect of the Cosmos is forgotten; all that is remembered is belief in God, and its effects upon the creatures inhabiting our petty planet. No wonder the Pope condemned the pragmatic defence of religion. We come here to a fundamental difference between James’s religious outlook and that of religious people in the past. James is interested in religion as a human phenomenon, but shows little interest in the objects which religion contemplates. He wants people to be happy, and if belief in God makes them happy let them believe in Him. This, so far, is only benevolence, not philosophy; it becomes philosophy when it is said that if the belief makes them happy it is “true.” To the man who desires an object of worship this is unsatisfactory. He is not concerned to say, “If I believed in God I should be happy”; he is concerned to say, “I believe in God and therefore I am happy.” And when he believes in God, he believes in Him as he believes in the existence of Roosevelt or Churchill or Hitler; God, for him, is an actual Being, not merely a human idea which has good effects. It is this genuine belief that has the good effects, not James’s emasculate substitute. It is obvious that if I say “Hitler exists” I do not mean “the effects of believing that Hitler exists are good.” And to the genuine believer the same is true of God. 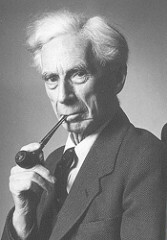 James’s doctrine is an attempt to build a superstructure of belief upon a foundation of scepticism, and like all such attempts it is dependent on fallacies. In his case the fallacies spring from an attempt to ignore all extra-human facts. Berkeleian idealism combined with scepticism causes him to substitute belief in God for God, and to pretend that this will do just as well. But this is only a form of the subjectivistic madness which is characteristic of most modern philosophy. James on Vos and Van Til: How Wide the Divide? Brandon Adams on Vos and Van Til: How Wide the Divide? Theme based on Coraline by Automattic. Proudly powered by WordPress.